The end of Day Three was less than triumphant. After a liesurely, delicious, and a little late, lunch in Franklin, North Carolina we head toward Asheville. I’m excited. In all my travels, in living in Virginia, going to college in North Carolina and living in South Carolina I had never been to this artists mecca. I had taken over the wheel. I am a stellar driver on the open road. I travel a respectable rate of speed just above the speed limit, with traffic but I’m not reckless. Honest. I love to drive. In town? A new town? My desire to be in control levies a smack down on my wandering spirit. Crankines began to seep in through the windows like a fine mist covering every thought or idea. I begin to develop of sour taste for Asheville solely based on the fact that I don’t know where I’m going. After a few left turns and a drive along a river bank, I pull into a parking lot shared by a couple of old warehouses that have been retrofitted into artists studios. At last. We get out, breathe, then poke around the first one. Pottery mostly. A weakness. But I am strong, instead I take a card that I will most certainly promptly lose to rediscover in a year wondering where I got it and why I have it. 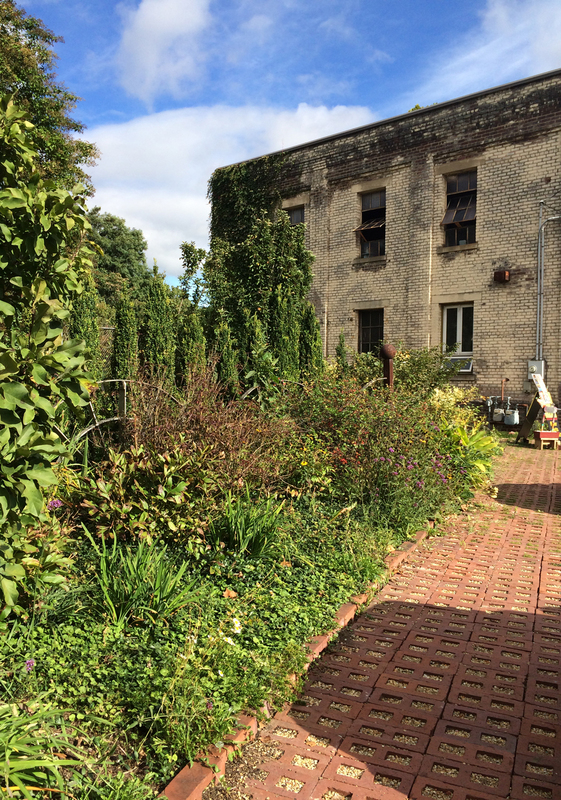 Between the old brick building and the railroad tracks is a small garden with a few sculptures. We walk halfway in, see all there is to see and back out. It’s a lovely place for the folks that work here to take a break, have a picnic. I am calmer now. I’m ready to get back on the road. In the passenger seat. We find our way into downtown Asheville and park. My spirits are buoyed by the people promenading along the wide sidewalks. 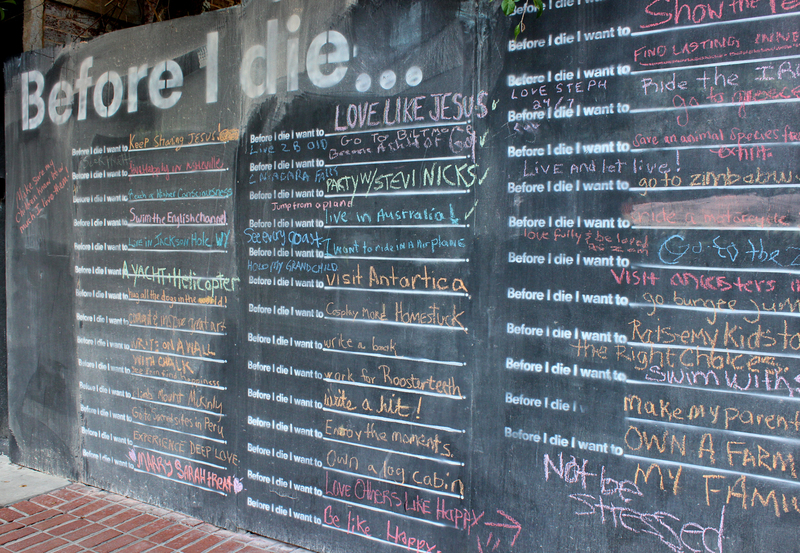 A guy with a guitar plays at an outdoor bar, a giant blackboard asks what I ‘d like to do before I die and a sign points to a rooftop bar. We pass through an ultra modern, urban chic, narrow excuse of a bar, pay for a glass of wine, then head upstairs. The weather is great and the view is beautiful. We look at each other as if what we are about to say may hurt the other’s feelings. I go first. “Maybe we’re doing it all wrong,” I offer. I take my time with the wine, I know I will not be staying here tonight so this time will have to inform my experience of Asheville. As we take in our rooftop vista, our eyes always come back to each other. There is still apology in them. And a little disappointment, exhaustion, just a hint, maybe. I take my last sip. We exit the same way we came in. “Let’s walk around a little before we go. I just want to make sure.” There’s something missing for me. For us. There’s life on the streets. On the surface there are some great shops and restaurants, but I can’t feel its heartbeat. I don’t know who Asheville is. That’s it. This charlatan epitomizes Asheville for me. He’s tryng too hard. It’s trying too hard. But I am not dismayed. I know there is magic in this place and I intend to find it. It won’t be this trip, but I will be back. By way of assurance, I pass by a store with open doors that beckons me in. It feels like home. It is grounded. This is what I had expected. I realize too late that it is my expectations, my very desire to make this place into what I had imagined, that has tripped me up, not the place itself. I wanted it to be a certain way, to welcome me with open arms and make me want to stay. It’s all my fault. By looking for what I had expected it to be, I missed what it was. Is. I will be back. I will come unclouded by judgment and open to the gifts it has to offer. There are always gifts. This time, the gift was simply awareness of my expectations. Back in the car we head north once again. We’re quiet. Tired. We find a lovely hotel in Hickory for the night. I wonder what’s in Hickory?